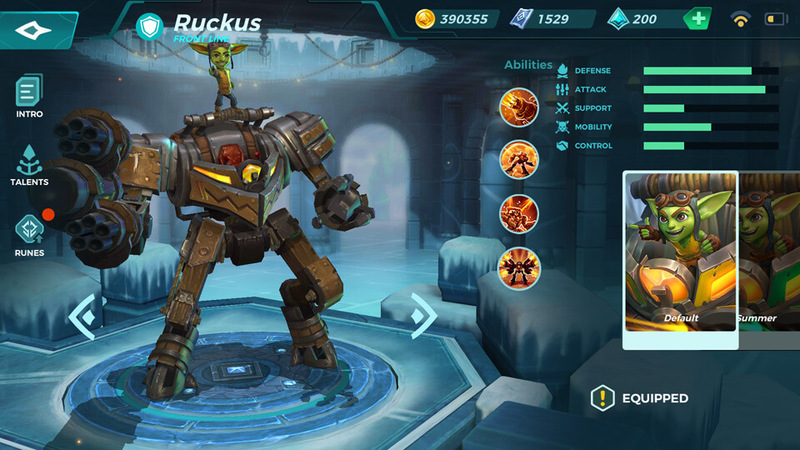 Ruckus controls the battlefield from within his modified mechanical suit, Bolt. 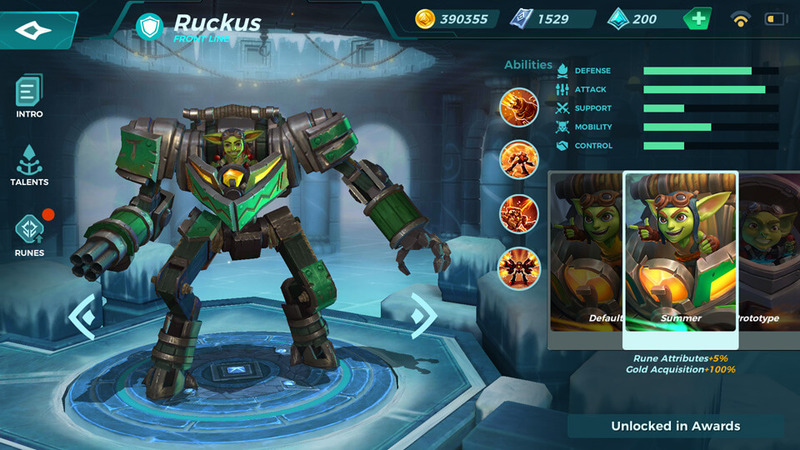 Ruckus may be slow while firing, but his miniguns and rockets will tear through even the toughest enemies in seconds. CD: 1.3s. Rapid firing miniguns that deal 85 damage per shot and deal up to 1200 damage in total. CD: 7s. Create an energy shield around yourself for 3.5s, absorbing 2000 damage. Nearby enemies are slowed by 75% for 3.5s. CD: 15s. Fire 2 missile that explode after hitting the targets, each dealing 450 area damage. CD: Energy Gained. Activate two additional miniguns that deals 85 damage and two rockets launchers that deal < 450 damage. Your movement speed is reduced by 65% during Hexa Fire. Level up to active a talent. 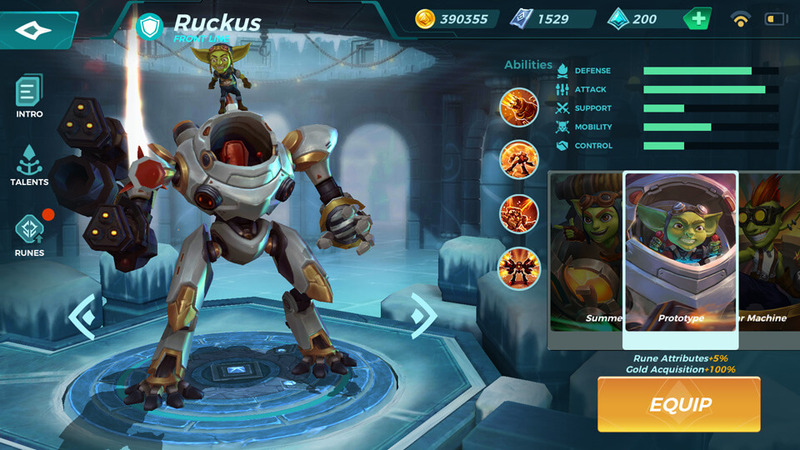 You can level up 5 times, and each time you level up you can select from a set of two different talents. Basic attacks deal 20% more damage. Ability cooldowns reduced by 20%. Movement speed increases by 20%. 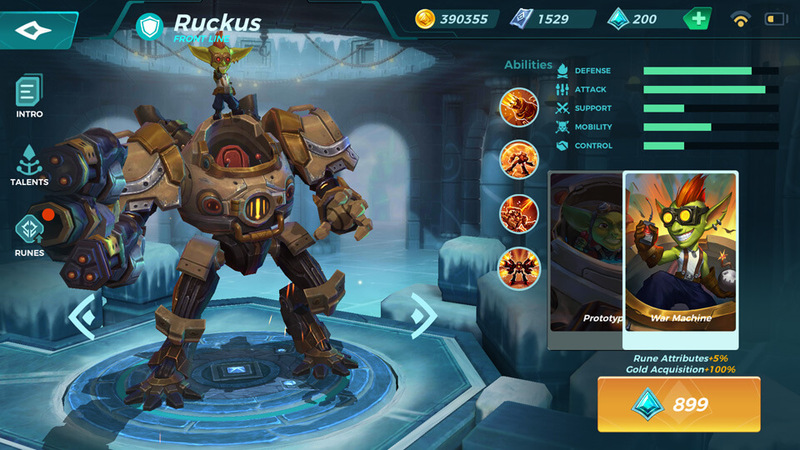 Max health increased by 20%. Gain 25% basic attacks damage reduction. Gain 40% area damage reduction.